CD + T-SHIRT (100% cotton) Bundle! The Austrians of EREBOS have been an integral part of the death metal underground scene since 2002 in the alpine state. After their 2003 demo and two self-produced albums (2004 and 2006), the present album "Heretic" is the fourth output of the sextet, which represents the next step in their musical career. Musically they have long since found a firm place between the genres and offer the inclined listener uncompromising Death Metal with melodic influences, who renounces unnecessary experiments and just hits the mark! With their stirring riffings and two singers, who with growls and nasty screams impose their own note on the brute sound of the band, the strain on the neck seems to be the declared goal of their musical attacks. 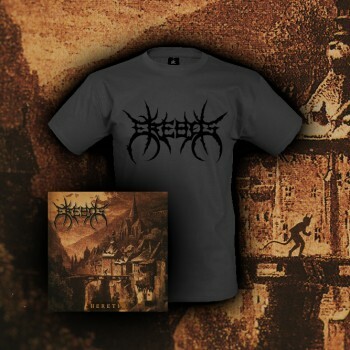 Heretic was recorded and produced by Lukas Rappitsch (CroworD) and mastered by Michael Piller at the newly founded Elophos Hill Studios in 2018. Dr. Winter/Teratogen is responsible for the stunning and atmospheric artwork (e.g. In The Woods, Haemorrhage, Brutality).